I am a Bears fan, the members of my family are Bears fans so it is usually hard to praise anything the Green Bay Packers do. It is, therefore, difficult to praise Aaron Rodgers record performance of completing 34 of 42 passes for 480 yards. It is equally difficult to say that Aaron Rodgers is possible one of the best quarterbacks in the NFL today. Before Sunday’s game Aaron was not feeling well, his neck was sore and stiff before the game. He praised the team chiropractor for helping him feel better. I wonder what would have happened on Sunday without that adjustment? Perhaps the Packers would be 0-2, but since he did get an adjustment he was able to perform at his best and lead the team in a clear victory over the Redskins. In this post game interview Aaron Rodgers discusses his neck pain and the adjustment that helped him feel better and then perform at his best. 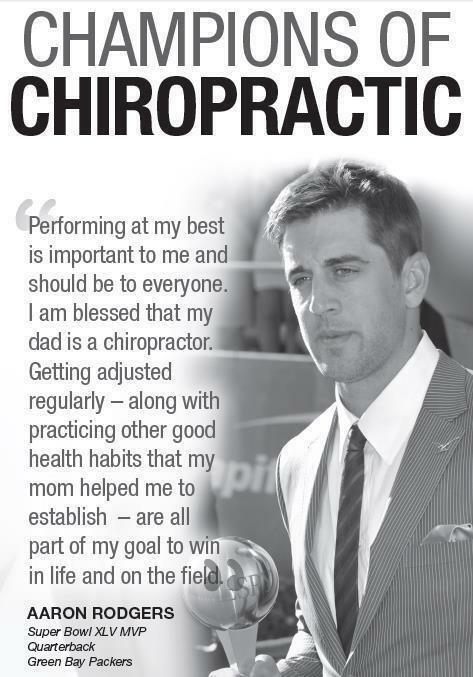 Aaron Rodgers, by the way, is the son of a chiropractor from California. 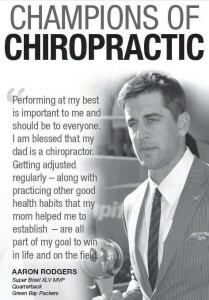 He understands the importance chiropractic care can have on his health and ability to perform at his best. Chiropractors work with just about every professional sports team in the country, the Packers are no exception. If chiropractic care can help professional athletes perform at their best how much more can it help you experience a better life.